Stormy Dragons are competitive on the water and are also very caring about our playground! It is in the Stormy Dragons DNA to leave things a better place and always pitch in to make a difference. Recent examples are: clean ups at the Sea School after devastating Super Typhoon Mangkhut, our collection of white goods and household items for the Tai Tam Villagers so terribly affected by the storm surge, upcycling of old rashee shirts and gear to communities in need, and general clean up and respect for the Village we paddle from and the waters we paddle on! A natural next step in our commitment to the environment was to take the Green Dragons Pledge to Paddle Without Plastic! On Saturday, 23 March, Stormy Dragons officially took the pledge to join the Green Dragons Community. Green Dragons is a collective of dragon boat paddlers from different HK teams that have embraced plastic free advocacy, both in our dragon boat practice and our daily lives. All Green Dragon members are collectively united in the goal of making an impact to clean up the beaches, shores and waters we paddle on. 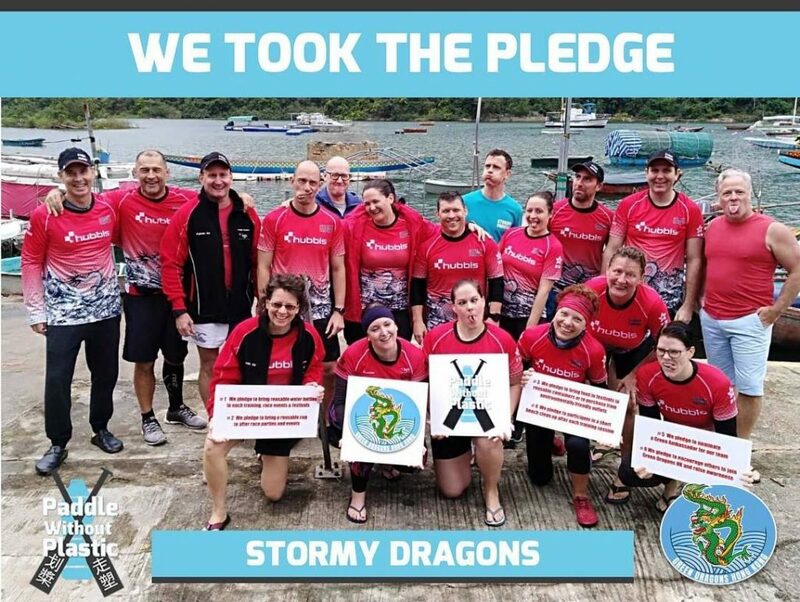 Stormys has taken the pledge to ‘Paddle Without Plastic’, to clean up our beaches and shores and to strive to influence organisations around Hong Kong to do the same. We will continue to lead by example and be ambassadors to a single use plastic free way of life with the goal of clean water for us and all dragonboat paddlers to train and race on! This entry was posted in Stormy News and tagged Dragonboat, green dragons, paddle without plastic by Stormy Dragons. Bookmark the permalink.